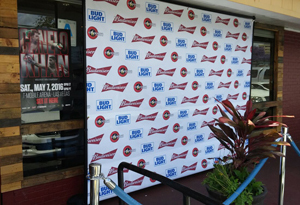 Attractive, affordable and effective, step and repeat banners can be used during many events. You might not know they’re called “step and repeat banners”, but you’ve probably seen them all the time. Each time a sports team has a press conference or post-game interview with the media, they are able to showcase their team through these signs. Custom step and repeat backdrops are regularly used at charities, fashion shows or red carpet occasions. When used as a backdrop banner, the matte finish allows people to take pictures without the camera’s flash reflecting off of them or the banner. 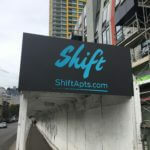 Using step and repeat banners in a public space increases brand visibility because people will snap photographs in front of these marketing signs. 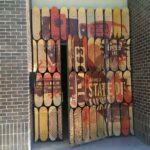 If these images surface on social media websites, with the backdrop banner in the background, your brand could receive countless impressions. Step and repeat banners are also helpful at charity events. By including a business logo, name or symbol, organizations are promoting others that donate money toward their cause. Sponsors will be happy that their company is getting positive publicity. Step and repeat banners are a hit with any age group across many industries. Backdrop banners can be tailored toward a business’ needs. If its primary use is to be a background during a press conference, using the 8′ x 8′ sign may work best, but for photograph backdrops or large groups we can custom make your banner up to 20’ wide if desired.